So we should be grateful for the person who thought of the pronoun in the first place. 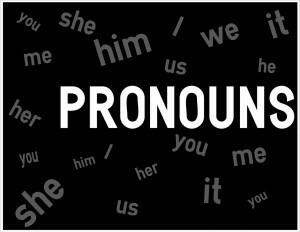 Whoever you are, Mr. Pronoun Inventor, we salute you! Remember, pronouns are substitute words. They take the place of nouns and other pronouns. Words that get replaced by pronouns are called antecedents. Bad: When you walk through the doors, you enter a large, paneled library. Still Bad: When one visits Paris, one should visit the Lourve. Better: The doors opened into a large, paneled library. Better: Vacationers in Paris should make a point of visiting the Lourve. Good writers also avoid using the “anonymous they” to refer to that mysterious and unidentifiable group responsible for just about everything in the universe. Bad: They should invent a more efficient automobile. Better: The automobile industry should invent a more efficient car. Bad: They say no two snowflakes are exactly alike. Better: It’s commonly known that no two snowflakes are exactly alike. Never use they unless you can identify who they are. Another awkward habit is using the word it without making clear exactly what it is. Bad: It says in my textbook that turkeys cannot fly. Bad: On the TV show I saw last night it said that unemployment is rising. Improve these kinds of sentences by changing the subject of the verb and getting rid of some unnecessary words. Better: My textbook says that turkeys can’t fly. Better: The TV show I saw last night said that unemployment is rising. Sometimes a reader can’t tell which noun is the correct antecedent of a pronoun. Don’t make him guess. There’s no trick to improving these. Just make sure that the pronouns you use refer clearly to the correct antecedent. Better: “Jim lost his wallet,” said Tom. Better: The union workers were angry at the size of their supervisors’ pay raise. Pronouns are valuable little words. Use them carefully. If you don’t, you’ll only confuse your readers. Make a blogger’s day. Leave a comment below. Hello. 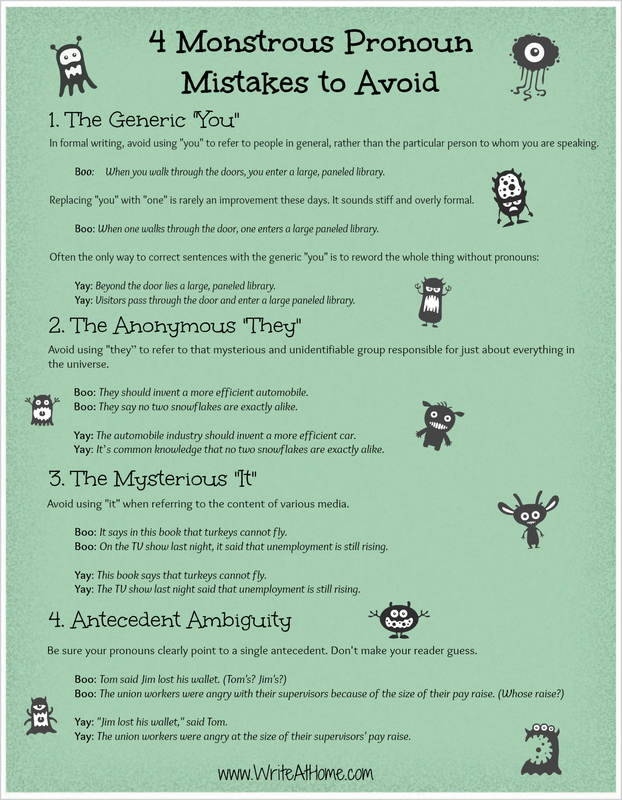 I’ve just finished reading the “Top Ten Mistakes Teen Writers Make” just now. I like the book so much. The explanation can be applied directly to practice, thus making the book really useful. As for the blog, I’ve just read few posts but the ones I’ve read are all good, including this one. I wish you happiness and success, thank you for helping me and lots of people in writing! Wow. That’s very nice. Thank you, Lia. I’m glad you are benefiting from the ebook and this blog. I appreciate your taking the time to say such nice things. The chart is excellent; it provides helpful information in an engaging way. Hi, I don’t know if you are reading this anymore, but I’ll try anyways. Is there such a thing as using pronouns too little or too much? When I read my own writing (short fiction stories), I sometimes second guess myself whether I am using too few or too many pronouns. Maybe I’m just psyching myself out, but I wonder if it might be a bit jarring for the reader to see the same word–either a name or pronoun–multiple times over the course of a paragraph or two. Are there guidelines for optimal pronoun use from the perspective of reading flow rather than clarity? Hi Blaise, I keep up with the blog. Things are busy at the moment, so it’s not every day, but I don’t go long without checking for comments. There’s no particular rule for pronoun use, but any word can become irritating or distracting if it’s used too often. It’s simply a matter of style and intuition. If you think it might be distracting, you’re probably right, so look for ways to avoid being repetitious. Then again, sometimes we overanalyze our own writing. You should ask some friends to read it critically and see if they notice anything. Of course, a book can’t “say” anything, can it? Not in the literal sense, no. But our language is full of idioms like that. It’s not unusual to hear something like “This article says to….” or “I read a book that said….” We all know the speaker isn’t being literal. Would “My textbook showed me that turkeys cannot fly,” or “I learned from my textbook that turkeys cannot fly.” be acceptable substitutes? Sure, Huey. They are acceptable to me. Great blog, Brian, and I love the chart! this is good! i’m just today reviewing pronouns for the ca state tests. my 8th graders don’t get it and don’t seem to care. ima show them this page. maybe it will help them see that using the generic “you” in their writing is ineffective. i especially appreciate the good examples. My pleasure, MizzG. All the best to you and your students. I’m not completely sure, but I think that there is a mistake in the fourth sentence in section 2. It says, “It’s commonly knowledge that no two snowflakes are exactly alike.” I think that it should be “It’s common knowledge that no two snowflakes are exactly alike.” or “It’s commonly known that no two snowflakes are exactly alike.” Thanks for all the fun posts!